Students at Sun God Festival. Photo Credit: Alwin Szeto. 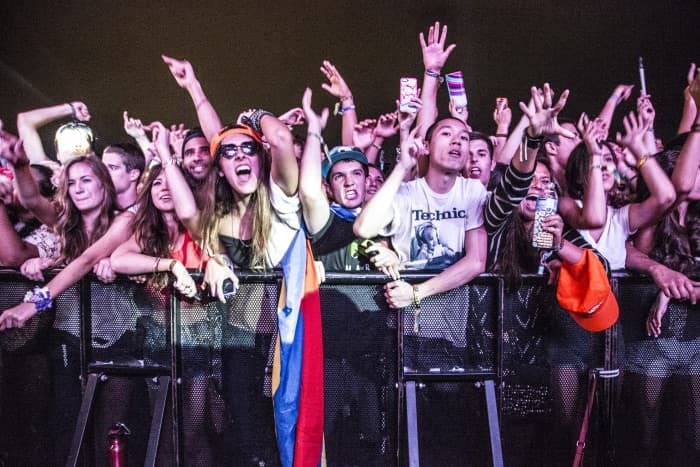 Associated Students Concerts and Events Associate Vice President Seraphin Raya sat down with the UCSD Guardian to grant some insight into what the 2015 Sun God Festival will look like, in terms of both regulations and new activities. Guardian: Are there any firm plans in place for the 2015 Sun God Festival? Seraphin Raya: Sun God Festival will be held on May 3, 2015, two weeks earlier in the quarter than in years previous, on a Sunday rather than a Friday and the hours of the event will be reduced to shift the majority of the activities toward the day time. The exact length of the event and finalized times have not been yet set; sometime soon, I hope. Event staffing policies and protocols are currently being re-evaluated to ensure that we have the best practice in place when it comes to health and safety for our students, including looking at the Village and the I-House policies. We’re working on addressing concerns that students have had in the past about these policies, so we’re addressing those and making sure that all the little kinks that we had for this first past year are better implemented. There will also be a focus on the venue entrance and exits to mitigate any kind of potential challenges to the event and reduce the impact that it has on the community and campus. G: Is there any chance of the Festival continuing on as it has in the past, which is something that a lot of students want? SR: Sun God Festival has been going on for 34 years, and it depends on when in the past you’re talking about. When it initially began, when it was just in Main Gym with kind of like a vendor fair/org[anization] fair in the Old Student Services Center. It could also be when it was in Price Center Plaza before the concert in RIMAC Field. Back in 2006 is when we shifted to do what we call the “current model” of the Sun God Festival that we know of today, and that was there in place for about four years until now when we’re deciding on looking at things we can change. I think that if the student body reacts well to this festival and if the concerns that have been brought up are mitigated to some extent, I think there’s definitely potential for the students to have more of what they want to see at the Festival. G: So, what you’re saying is that the festival has been evolving for as long as it’s been around. SR: Exactly. So as long as our student body is changing, the festival will continue to evolve; it’s one of the beautiful things about the Sun God Festival. I’m excited to see what it looks like 10 years from now. G: What are some of the problem areas with the past festivals? What are you guys doing to address those and what would you want students to know about those problem areas? SR: When I ask students, “What do you love about the Sun God Festival?” the most common response that I receive is, “It unifies the campus.” For this one day it doesn’t matter what college you’re from or what [y]our major is; the only thing that matters is that we’re all UCSD students and that we’re having a great time on the field.” The problem arises when we create a campus climate around the event that pushes people to drink past their limits or take a drug that unknowingly contains some kind of harmful substance. Some of the ways that we’re addressing it is by the changes that we’re placing — creating environmental changes like shifting it more toward the day or taking a look at a Sunday rather than a Friday so we’re not conflicting with classes, so we don’t have such an impact on the school. I think at the end of the day being conscious of ourselves and the people we’re around and remembering that everyone has their limits. There’s no need to go over the edge, per se, and it’s important to recognize where we should draw the line. G: Several different students have said they’re going to “go even harder” now because of the restrictions. Can you address that? SR: I think if students want to guarantee the end of the Sun God Festival, that’s the one way to guarantee that. And I definitely see that students feel suppressed and don’t want to feel all of these new regulations on them, which is why my team is working and looking at what can we add to the Festival that brings value to it, what can we add that will get students excited. So we’re looking at those possibilities. This year we’ve put more money into our headliner than in past years. So we decided on our first offer, and it was bigger than what we spent for our headliner last year so it’s really exciting. We’re hoping that by generating excitement, people are kind of not thinking about all these new regulations that are put in place. G: Can you give us a hint about what genre that headliner might be? SR: Nice try, you’re not going to get it out of me that easily. As always, it’s top secret until the big release we have. Last quarter, our ASCE entertainment survey collected data on what the student population likes, and according to the surveys — just to give you a little insight of what the surveys said — apparently the dubstep craze is fizzled out, so students aren’t as interested in hard electronic music as they were in the past. That was interesting to hear, and students are also not as interested in country music. G: Have safety concerns like that grown over the past few years? Is that why we’re placing more of an emphasis on safety? SR: Yeah, at the end of the day we don’t want to be curating something that puts our students in danger. Every year, we talk to students dealing with conduct cases after the Festival; they end up having to go to conduct review boards. We deal with people who end up having to go to detox and have these huge detox fines on top of them. We have people that have to go to court cases because of DUIs, and these are real situations that are occurring and we don’t want students to be facing these after the Festival. We want there to be an event where students are having fun, and there’s [sic] no repercussions of things that occur. G: What kind of additional benefits are we looking at and are those the cool-down activities that have been mentioned? We are working to create more experiences on the field for students. Students have told us in the past that, besides the music and the dancing, there’s not much to do at [the Festival], and we’re working on changing that. We want to keep students on the field, so what we’re really excited to do is changing the midway tent area into an actual midway area — so getting games and rides for students to actually enjoy and having a more interactive piece to the festival. We’re looking at ways to add attractions to the festival: adding an emphasis on art and decor, bringing in student artist pieces onto the festival, potentially bringing more performers. We’re looking at getting different kinds of entertainers throughout the entire festival, looking at attractions that would make students stay on the field. Not so much as a cool-down event but a part of the festival that students are enjoying while they’re enjoying the music. G: Can you give us an example of something that’s been thrown around? SR: An example is having silk performers throughout the venue. We’re still looking at pricing and stuff like that, but that’s one of the examples that’s been thrown out. G: How much weight can you give to student input? And what’s the best way for students to put themselves through to ASCE? SR: We take student input extremely seriously. At first we started a list of over 500 musical acts; we take note of musical talent people are suggesting. People send us things through Facebook, through email, through our ASCE entertainment survey. Decisions are also based on who’s available that day, so it’s not just what students want; it’s also are the artists available, can we get them within our budget, all of that. So once we negotiate that, we spend a lot of time analyzing, debating, discussing [and] fortunetelling in order to decide who to send those offers to. Our staff — we are a group of music lovers, concertgoers, and we want to plan a festival that we ourselves would want to go to. Volunteer applications come out once the website is released, so there’s a possibility to get involved that way for those that want to get more hands-on and want to have ownership over some part of the festival. We also have our Sun God [Festival] committees. We meet on the fourth floor of Price Center every Monday at 4 p.m., so if anyone wants to become a part of the Sun God committee, they’re welcome to join any time.